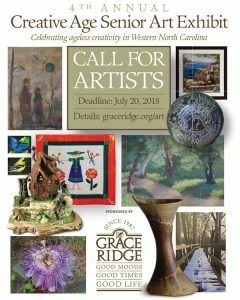 2018 Senior Art Exhibit - Grace Ridge Retirement Community - Morganton, N.C. Sponsored by Good Moods at Grace Ridge and benefiting the Burke Arts Council, Grace Ridge Retirement Community is hosting an invitational art exhibit featuring senior artists from western North Carolina and neighboring communities. The objective of the exhibit is to celebrate the talent of both professional and non-professional artists age 60 or older. This invitational exhibit will be open to the public August 24 – September 2, 2018. Public Exhibit Hours: 10 a.m. – 6 p.m. This event is free for all who wish to view extraordinary works of art. Being a part of our continuing care retirement community means living an active, fulfilling life shared with friends. We complement gracious senior living and Southern charm with endless opportunities focused on wellness, fitness and intellectual vitality. Call or visit to learn how you can enjoy retirement in a secure environment that supports your choices and preferred way of life. Sign up to get the latest scoop on retirement life at Grace Ridge.